Temperature : Max. 40°C and Min. 26°C in Summer. Max. 30°C and Min. 10°C in Winter. Rainfall : 45 cms to 60 cms. 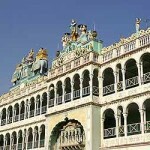 The semi desert region of Shekhawati is a colourful fantasy having a fascination uniquely of its own. ‘The open air art gallery’, is famous for its plethora of painted havelis, all commendable pieces of the rich artistic tradition of this region. Initially the region had a blank monochromic look but with subsequent historical and social development it has blossomed into a colourful profusion of art and life for almost 2 centuries from 150 A.D. to 1930 A.D. Shekhawati magnificent havelis display a unique architectural style. Air: The place can be accessed by air through Jaipur. Rail: The place is connected by rail with Jaipur. Local Transport: Jeeps, unmetered taxis, auto-rickshaws, cycle-rickshaws and tongas. RSRT buses ply between various towns and villages in the region. Havelis: Shekhawati’s magnificent havelis or mansions, built by rich merchants of the region, display a unique architectural style that evolved around the courtyards to ensure safety and privacy of the women folk and protection from the heat of the long and harsh summers. The beautiful wall paintings of 18th centuries make the haveli interesting for travelers. Lachhmangarh: One of the most imposing forts in the Shekhawati region, Lachhmangarh commands a bird’s eye view of the town modeled to resemble the city plan of Jaipur. It is founded in the early 19th century. Sakambhari: Famous for its 7th century temple dedicated to Sankari Mata, the town is surrounded by hills on three sides. 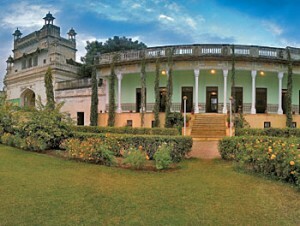 Ramgarh: Founded in the late 18th century by the Poddars. The Shani Temple of the Saturday God has delicately painted frescoes. Marvellous cenotaphs of the Poddars have exquisitely painted ceilings. 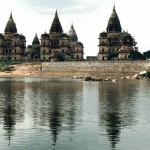 The Ganga Temple and some beautiful havelis add interest to the town. Harsh Nath Temple: An ancient 10th century temple situated on the Harsh Nath hills and 11 km from Shekhawati. Jeen Mata Temple: Jeen Mata is 29 km from Sikar of Shekhawati region at the Bikaner- Jaipur National Highway. Jeen and Harsha are mentioned as sister and brother in this folk literature and stories of their mutual affection and sacrifice are very popular in the Shekhawati region. Lakhs of devotees congregate here every year in April – May (Chaitra Navaratra) during the Jeen Mata fair. This entry was posted in Rajasthan, Shekhawati and tagged Harsh Nath Temple, haveli, Havelis, Jeen Mata Temple, Lachhmangarh, Piramal Haveli, Ramgarh, Sakambhari, shekhawati india, shekhawati map, The open air art gallery. Bookmark the permalink.